It is true that the fascists are making their mark in America. Thing is the people who call themselves fighting fascism are the very fascists they claim They've been punching, rioting, assaulting, burning, protesting, shutting down free speech, destroying property and more - all in the name of "fighting fascism". But now they've crossed a new line. For years, families in the greater Portland Oregon area have descended upon the city's 82nd Street neighborhoods to buy hot dogs and cotton candy from street vendors, walk in and out of local business establishments, watch high school marching bands, homemade floats and locally-owned classic cars meander down the street in the "Avenue of Roses Parade" which is a part of the now century-old "Portland Rose Festival." The Avenue of Roses Parade was scheduled for this Saturday, its website proudly proclaiming "...dozens of events spotlighting the diverse interests and culture of the community, the Rose Festival makes a positive impact on hundreds of thousands of lives annually, bringing smiles to the faces of both locals and guests. The community event is looked forward to by thousands." However this year, visitors will not have the opportunity to view the Avenue of Roses Parade. Radical left wingers have issued threats of violence which the city views as credible and thus made the decision to cancel this year's parade. What are these lefties so upset about? The inclusion of a small group of Republicans. who've walked in the parade for years, walking in it this year. "The annual 82nd Avenue of Roses Parade in East Portland has been canceled. The parade, which is the first sanctioned event of the Rose Festival season, was scheduled for Saturday, April 29. Organizers said the event was canceled "following threats of violence during the parade by multiple groups." The Multnomah County Republican Party (MCRP), whose members were going to march in the parade, said threats were made against their group. According to the Oregon GOP, organizers of the parade received an email saying that a group would take their own initiative to make sure the MCRP didn't march in the parade if organizers let them participate. "We will have two hundred or more people rush into the parade into the middle and drag and push those people out as we will not give one inch to groups who espouse hatred toward LGBT, immigrants, people of color or others," the email reads in part. The email, which the Oregon GOP posted on its website, further reads, "You have seen how much power we have downtown and that the police cannot stop us from shutting down roads so please consider your decision wisely." A copy of the original letter sent to Portland city officials along with their email communications among one another that ultimately resulted in the decision to cancel the parade are available on KGW's website. "A statement from the Oregon GOP, on behalf of the MCRP, says the group has participated in the parade for many years "and calls upon the Mayor, the Police Chief, and the District Attorney to take action against this criminal conspiracy to commit crimes of riot and disorderly conduct in violation of Oregon law." "We were aware of threats to disrupt the Avenue of Roses Parade on Saturday and were prepared to provide a police response appropriate to the needs of the event, which has traditionally been a family-friendly affair," said Sgt. Pete Simpson with Portland police. The new left in America. They didn't want Republicans to be in the parade and so now it has been cancelled for everybody. 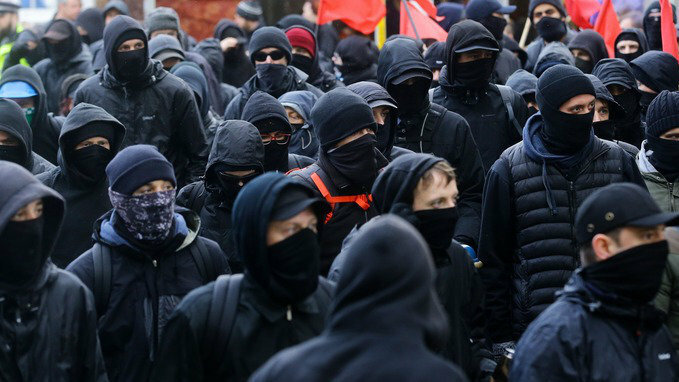 These maniac leftists who yesterday stormed the Heritage Foundation's building because of a proposal, who got Ann Coulter's speech at Berkeley cancelled, have robbed children and adults alike of a fun, charming community event, not to mention immeasurable costs to local businesses who won't realize the walk-in traffic they otherwise would have due to families and tourists avoiding the area for fears of safety. Yes these lovers haters of freedom have gotten a city parade cancelled...because they're fighting hate and bigotry.